I had a very pleasant surprise at my feeder full of Woodland Blend yesterday. It’s a common bird to TN, but uncommon to birdfeeders; the Red-headed Woodpecker. Sometimes people will mistakenly identify the Red-bellied Woodpecker as a Red-headed, but they really are extremely different. The video I took and posted shows both species visiting the same feeder. In over 25 years at my home in Pegram I’ve only seen Red-headed woodpeckers one other time. The habitat around my home is heavily wooded, hard-wood forest. Obviously not the habitat Red-headed woodpeckers prefer. However, one can easily see Red-headeds at Montgomery Bell State Park and Bowie Nature Park where there are a lot of pine trees. They seem to prefer more open habitat with evergreens. 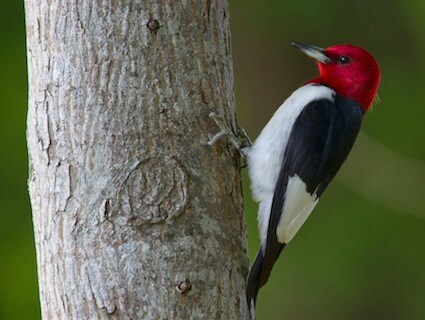 The Red-headed woodpecker is easily identified by its entirely red head, neck and throat. The back and wings are black with a patch of white visible on the wings. The chest and belly are snowy white. This insect, seed, and nut eater can be seen at feeders but not likely with regularity. Numbers of this stunning bird seem to be on the decline in large part due to habitat loss and competition from Starlings for nest-sites. The first Rose-breasted Grosbeaks of the season were reported this week being seen at feeders. I saw one briefly yesterday but was unable to get my video camera in time. Have your feeders ready because the Grosbeaks feed heavily as they migrate through the area. They like sunflower, safflower, and shelled peanuts, and will use a variety of feeders including tube and platform. Occasionally, they may be seen at suet feeders.